Last edited by Mark R on Tue Oct 23, 2018 5:10 pm, edited 4 times in total. Daddy tell me about girls? Son, one day you will make a girl very happy for a short period of time. Then she'll leave you and be with new men who are ten times better than you could ever hope to be. These men are called kayakers. 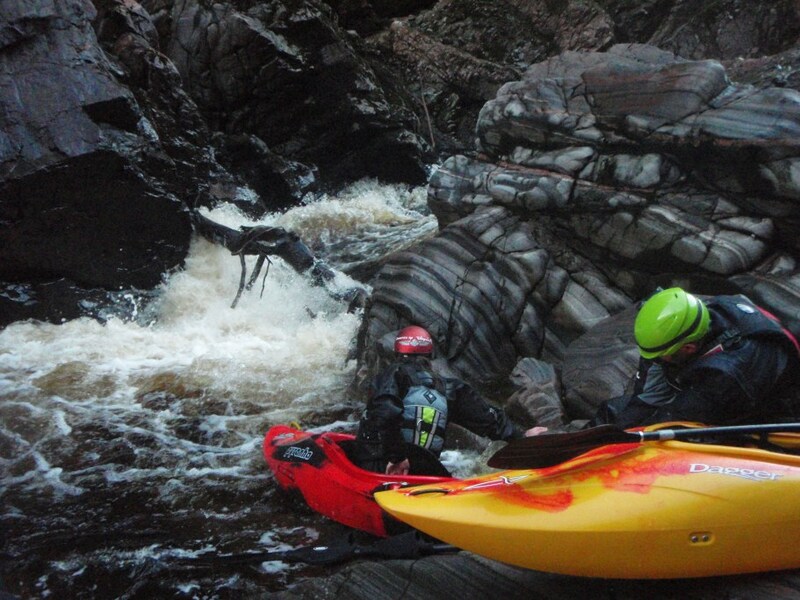 Just a heads up to anyone planning to paddle the Lower Findhorn. There a few new hazards in the river that people should know about. The couldron at Randolphs leap has a tree in it. At low levels it is runnable but dont get it wrong. At higher levels it may not look too bad but a swim in there would be dangerous. Pinball has a tree in it which is quite obvious and doesnt look to be a problem but there is a branch running right accross the main channel just below the drop which cant be seen. If you get a good boof its fine but simply droping in could result in the nose going under the branch. Also the drop has become more retentive because of the branch and at higher levels is difficult to punch through, I would suggest running to the left of the tree when the water is high enough. The slot has a tree jammed right accross it which is well out of the water at low levels but becomes a pour over at medium levels and looks runnable from the top, the veiw from below the rapid doesnt look so nice, definate portage!!. Corkscrew has changed due to a slab of rock breaking off and moving on the right. it has some very sharp edges and could be an entrapment hazard. run to the left of the centre boulder at low levels, at medium level it is fine to run the centre. In general there is a lot of debris in the gorge at the moment so dont run anything blind and expect trees to be jammed in undercuts or cracks. Also be aware of what is above you if your doing safety or lingering in eddies, there are alot of loose trees and rocks on the cliffs!! Randolphs Leap is clear, both cauldron and chicken shoot. Beware this strainer cannot be seen if you are in your boat at any point approaching the feature until it is too late. This is The Slot as far as I understand it. Have referred to it as that for 25 years or so. Tree still in place Sunday. May take a visit with chain saw or winch to remove. 'S e caidheagair a th'annam; deagh spòrs! My historical perspective on this, yes I am that old! !, is that Corkscrew used to be what you now refer to as Triple Steps. That rapid changed massively when some of the big boulders shifted. It used to be much harder because the main chute slammed onto a boulder and cushioned round it like a corkscrew to the right then you still had to thread two rocks and miss the big hole on RHS below. After the rocks moved, the name was somewhat non descriptive. The run is now pretty much a straight line. I may be wrong on all of this, but I don't think so. Subsequent slight confusion have existed ever since and I think that this is the reason. Rivers do change.......look at the Roy, headbanger no longer bangs your head!! It has become a meaningless name in same way and needs changed. Next time the guidebook is updated paddlers need to get a definitive description worked out. Have fun on the Findhorn and watch out for that tree. Wow, Chris...I think that's now three different takes on what rapid is what! Just to let you know that on sunday 18th Sept, there was a tree right across the entrance to the run leading into Randolph's Leap - at the narrow exit of the large eddy. (not sure if the one previously noted - I think it's a new one) The level on the SEPA / WTW gauge today showed the level at the time to be at 0.6. On WTW, this level is weirdly described as low /normal when it in my opinion it seemed more like high / normal. All channels at Randolph's were running strong with the cauldron a huge boiling brown mass. Point is here that the branch is visible at this level but seems stuck and if levels rise, then might then be underwater and not visible. Most folk will exit the Middle section in this eddy or will put in to run Randolph's after an inspection. However, it could be a strainer risk to anyone swimming on the last run into the big eddy. If it moves then possible to be a problem further down. Noticed another couple of large trees lying beached at Randolph's - just waiting for very high water to move them off again. Cheers Paul. Beware. Ran findhorn gorge today, pleasant G3-4. Sunny, warm day, snow on hills. However look at this gauge:Flash flood 2m rise in ten minutes. We had seen this on the gauge earlier in the week and assumed the gauge had unfrozen. It hadn't - wall of water down the gorge and would have made it a very different trip if still in the gorge. Randolph's Leap became G5 and Dulcie Bridge immense, scary mass of whirlpools, boils and holes collapsing into each other. Beware! Rjo103 wrote: Beware. Ran findhorn gorge today, pleasant G3-4. Sunny, warm day, snow on hills. However look at this gauge:Flash flood 2m rise in ten minutes. We had seen this on the gauge earlier in the week and assumed the gauge had unfrozen. It hadn't - wall of water down the gorge and would have made it a very different trip if still in the gorge. Randolph's Leap became G5 and Dulcie Bridge immense, scary mass of whirlpools, boils and holes collapsing into each other. Beware!